Steeking is technique used to safely and securely cut your knitting to create holes where you want them. It is frequently used with complex colorwork sweaters, because it is easier and faster to knit colorwork in the round. It can be scary to steek a big sweater, so I created this scaled-down steeking project to help knitters try out the technique fearlessly. 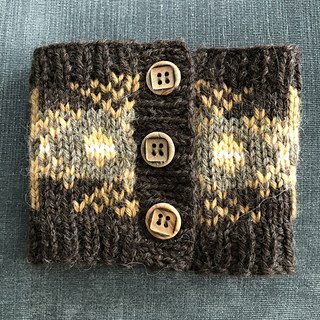 Think of this project as a mini-sweater vest for your coffee cup. The cozy is worked in the round with stranded colorwork to create a classic fair-isle pattern. Then follow the step-by-step guide to steeking with a crocheted reinforcement. You can do it! Use a US 5 circular 9” or magic loop. You will also need stitch markers, US F or G crochet hook and (3) ½” buttons. Yarn/pattern kits available. This is a great project to try it out without the fear of cutting your whole sweater! Must have completed the Beginner Knitting Class and be comfortable knitting on a circular needle. Kits will be available for purchase.